I love chili that contains beans, but RancherMan typically declares that it’s not ‘real chili’ if it contains beans. But I appease his purist NO BEANS IN THE CHILI mindset by including one of his favorites – dark beer! 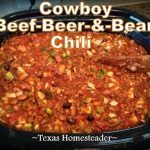 Recently a call went out by Working Ranch Magazine for our favorite recipe to be included in their Dinner Bell feature and of course I submitted this chili recipe. It won the contest! (blushes) What an honor. I’ve been asked several times to share my recipe so here it goes! But now back to the chili. The recipe is beyond easy! Brown the meat, saute the onions/peppers and dump it all in a stock pot to cook with the other ingredients. But because I’m a lazy, errrr, I mean BUSY cook, I typically use my slow cooker instead. I just dump everything in & let the slow cooker do all the work until I figure the flavors are all married & stuff… I typically start late morning & just let it do its thing until around supper time. Yep, I’m a shoot-from-the-hip cook like that! Is the recipe flexible? Well of course, or else it would have never made it in the Taylor kitchen! 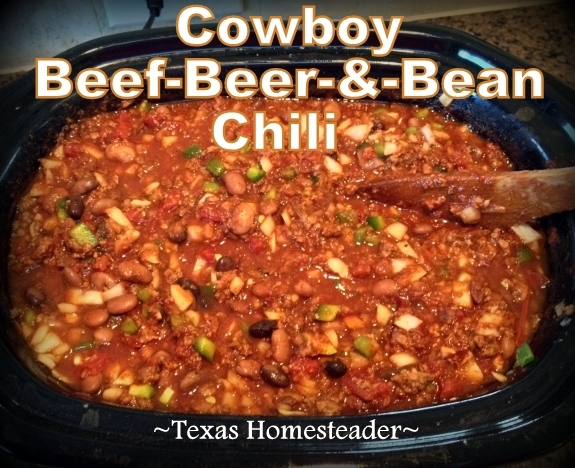 I often use chili-ground venison or pork from RancherMan’s hunting harvests in place of the ground beef. And I’ve used pintos in place of black beans when that’s what we had in the pantry. And the crushed tomatoes – whatever I’ve got handy needing to be used. Sometimes it’s rotel and sometimes just diced tomatoes, I typically try to get the measurements about the same but otherwise the sky’s the limit. And I also like to toss in about 1/4 cup of masa harina in the last hour or so of cooking just to thicken everything up too, but that’s totally optional. RancherMan likes it that way best. Brown ground meat in stockpot over medium heat until meat is no longer pink, breaking up into crumbles. Remove with slotted spoon and set aside. Pour off all but a tablespoon of the grease. Add onions and garlic; cook and stir 3 to 5 minutes or until onions are tender. Then add bell peppers and jalapeño; cook and stir 4 to 5 minutes or until peppers are tender. Return beef crumbles to stockpot. Add chili powder, cumin, oregano, thyme and red pepper. Stir in crushed tomatoes, diced tomatoes, broth, beer, tomato paste and honey; bring to a boil. Then reduce heat; cover and simmer 45 minutes. Uncover stockpot; add masa harina if desired & continue simmering 30 minutes or until thickened to desired consistency, stirring occasionally. Stir in beans; cook 5 to 10 minutes or until beans are heated through. Season with salt and black pepper, as desired. Garnish with cilantro, if desired. 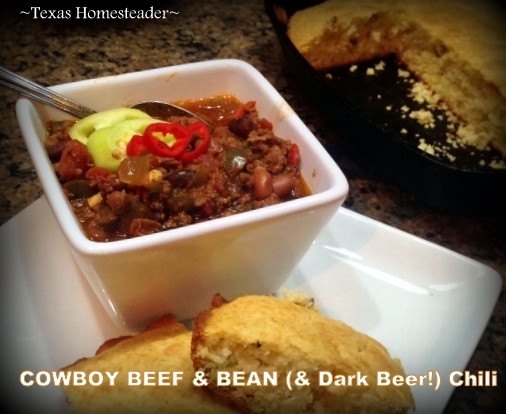 I like to ladle this hearty chili into big bowls and top with spicy sliced peppers and include our favorite homemade Jalapeno Cornbread. Yum. Bon Appetite! 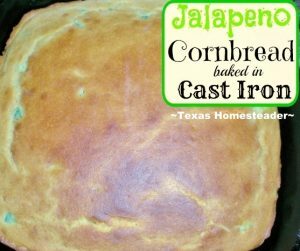 This entry was posted in Blog Posts and tagged Cooking, Ranch Life, Recipes on March 22, 2013 by Texas Homesteader. Congrats! That’s so great. I guess they knew a good recipe when they saw it!! Thanks for sharing it with us at the Four Seasons Blog Hop. I will pin this!! Congrats on your win! Thanks for sharing your amazing recipe at TTF! Congrats on winning the recipe contest! 🙂 I love adding dark beer to chili, it really adds some depth of flavor. My Farmgirl Friday recipe is for Chocolate Guinness cake. Must be beer day! LOL!! Pingback: The HomeAcre Hop #13, A New Co-host, And a Giveaway! Ohhhhh yummy. We really like chili. Pinning!! Thank you again for sharing at the HomeAcre Hop. What a neat life you live!! Love your sweet spirit and positive attitude! Thank you for sharing this wonderful recipe! I can’t wait to try it and many congrats on the contest award sister! God bless you and your family and the material things He has blessed you with that helps others. You’re a good soul! Thank you for the reply with the helpful suggestions! I am very proud to say I have Texas in my blood even though I don’t live there at present. My father, God rest his soul, was a dyed in the wool Texan and my ancestors settled Angelina County. I have two sisters that live down that way. One in Midland and the other in Shepherd. There’s something quite special about true Texans. What you see is what you get. No need to put on airs and visitors in their homes are treated like family. The way a Texan speaks is articulate and to the point and the words are chosen perfectly to convey a thought like it’s an art form, yet it’s as natural as breathing when you’re from down that way. And the accent! What woman wouldn’t go weak in the knees hearing George Strait say “Howdy Ma’am”? LOL It has truly made my day to find your site and I will have alot of fun exploring all that I’ve missed. I was born in S.C. but lived in WY most of my life. My stepfather is a cattle rancher there so I’m familiar with the life you live. Throwing hay bales at 5am in 20 below weather to feed cows is just a day in the life! LOL We live in NV now. My husband is down in Houston right now for his job. Well, I won’t bore you to tears much longer! It’s just always nice to meet someone REAL and who knows what down home living is truly all about. Again, God bless you and thank you again! Woohoo!! Congratulations on the win!